Traditionally, all spinal surgeries were performed as open surgery – meaning a large incision is made, enabling the surgeon to clearly see and access the areas being operated on. The last decade and a half or so has seen a shift towards minimally invasive surgery, with the development of tools and techniques that allow surgeons to perform procedures with much smaller incisions. Less invasive techniques generally mean less damage to surrounding tissue, reduced scarring and quicker recovery times, as well as other benefits like reduced risk of infection and blood loss. However, minimally invasive surgery can have its own set of limitations. Performing technical surgical procedures via a microscope is complex, and heightens the need for highly targeted technique. 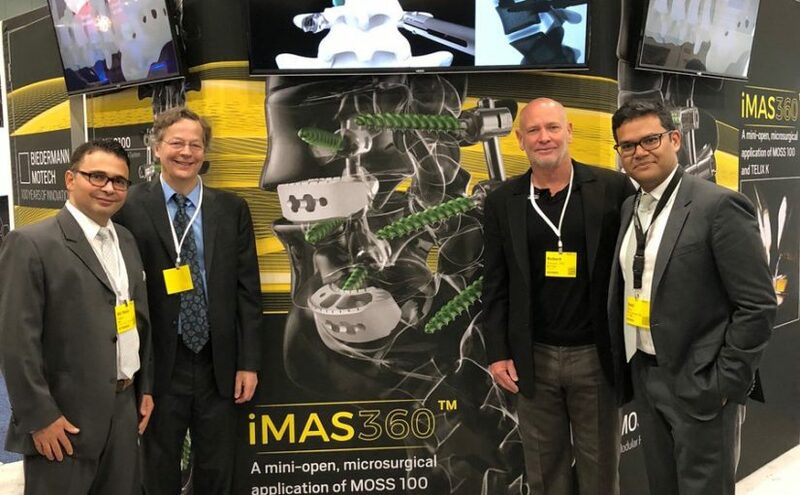 iMAS is basically an innovative evolution of minimally invasive spinal surgery. iMAS is minimally invasive surgery – but its principles extend far further. Built around a philosophy which breaks down understanding of spinal anatomy to whole new levels, iMAS is about truly targeted surgery. Consider a spinal disc – traditionally, this would be seen as a single entity. With the iMAS approach, a disc can be separated into seven distinct zones located within the interpedicular anatomy (this is the space/distances between the pedicles – the two bony spikes on either side of each vertebra). This provides scope for surgeons to achieve a far more focused view of the entire anatomy of the disc and surrounding tissues from all angles, and build a far more detailed picture of the pathology (in other words, what’s going wrong) unique to each patient. This knowledge, combined with a skillset of techniques that can be adapted to suit the anatomy and pathology of each patient, means surgeons can perform procedures that are more targeted than previously possible. iMAS surgery is never ‘one size fits all’, instead usually targeting one to three of the seven interpedicular ‘zones’. Targeting problem ‘zones’ in this way offers the potential for improved outcomes for the patient in multiple ways. Not only are they receiving a more tailored treatment, but the approach further reduces damage to surrounding tissue – particularly muscle tissue. Post-surgery rehabilitation is vital in spinal surgery recovery, for both short and long-term outcomes. Our goal is to help patients receive the best possible results, but restoring full function and mobility and keeping back pain away in the long term is often highly dependent on the patient’s engagement with keeping strong and active – therefore minimising muscle damage during surgery is imperative. This is at the heart of the iMAS philosophy, and so far, very promising improvements in patient recovery times and outcomes have been seen.If you want more information about how Complex Spine can help you to manage your pain, book an appointment with us today.